Choose the right light for the project! Daylight's Combo Lamp features a low-heat 28W Daylight energy-saving tube (150W equivalent) for perfect color-matching, and a 100W incandescent non-Daylight setting for a warmer light. The tube and bulb can be used together or independently, offering artists three lighting options. 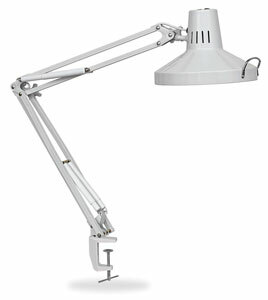 The lamp features a durable metal arm with internal springs, and can be affixed to easels, desks, and other work areas with an included table clamp. It is 30" (76 cm) high when fully extended. Weighs 8½ lbs (3.9 kg). The incandescent, non-Daylight bulb is not included. ™ Daylight is a trademark. Daylight bulbs offer an improved quality of light that imitates mid-day north facing light that artist's love. This allows artists to work in their studio with a light that simulates working outdoors. In addition to their tremendous light quality, Daylight bulbs use less electricity and last 10 times as long as incandescent lights. These lamps are good for you, good for the environment, and great for your wallet. 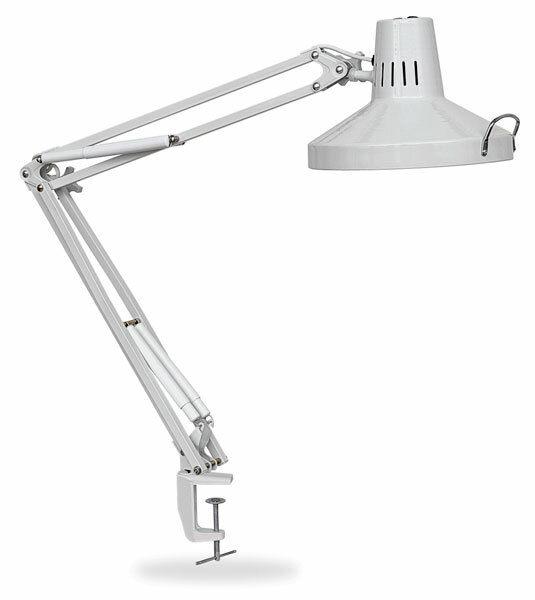 As with all Daylight products, these "specialty" lamps include energy efficiency, color corrective lighting and they reduce eye-strain. This video features a variety of lights that may have a special feature that is just what you're looking for.